Cela’s story is one of determination and sacrifice. Cela is a HS Junior and lives in Sacramento, yet she has been training at MBsand for the lat 18 months, flying in twice a month. She compliments her MBsand training with games and workouts at Precision Sand Club and AVD Going Vertical in Sacramento, in weather that can easily reach 100 degrees or dip below 50. Like many volleyball players, she started out playing indoor. She discovered beach her freshman year with partner Zoe and never looked back. Cela’s family made the commitment to provide the Southern California beach volleyball experience and reached out to MBsand coach Patty for additional training and guidance.To keep costs down, Cela recruited friend/players (Zoe, Karmin or Sessa) to fly down with her to train and fly back all on the same day. That made for early wake up calls, long Saturdays and navigating travel on your own at 15 yrs-old. Cela has improved quickly and has experienced success on the beach. She is one of the top HS players in Northern California and won 4 medals in AVPFirst events. 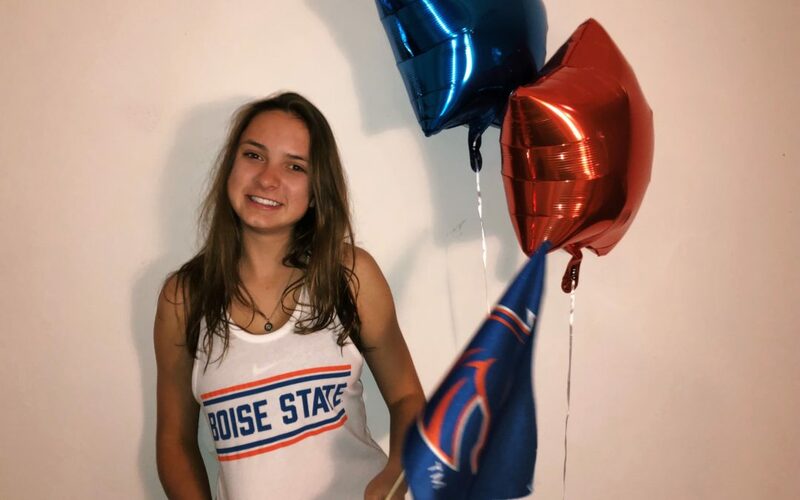 Boise State, coach Allison Buck took notice and now Cela will be a bronco in the Fall of 2019. Congratulations Cela!! !